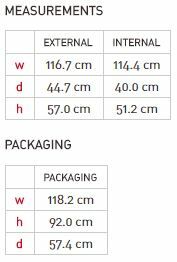 Internally, Comfy’s storage capacity equates to 270 Litres / 71 Gallons and supports a weight limit of 30 kg / 66 lbs therefore provides ‘medium-sized’ store accommodation when comparing deck box dimensions. 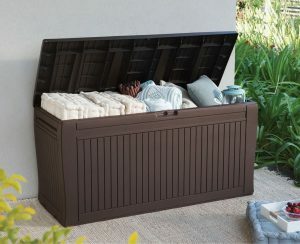 If you’re on the lookout for a stylish facility to store a few outdoorsy lounging cushions, books & magazines, Comfy is purposely designed to ventilate freshness to the interior through faint construction gaps to eliminate foist & mildew growth on fabric materials & papers when clammy conditions persist. We’re delighted with the handiness our deck box provides during summertime. 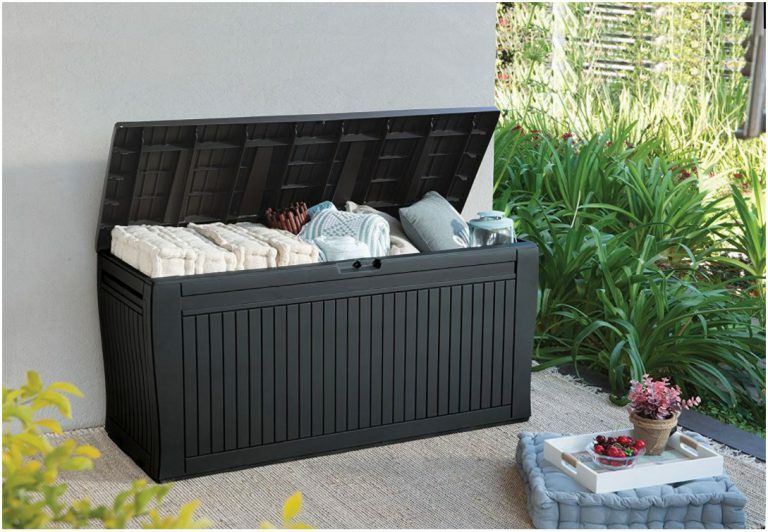 To walk out onto the patio on a warm summer’s morning, open the box and furnish the cushiony comforts in minutes as opposed to previous predicaments of trying to find sufficient room inside where to squash their bulkiness, epitomises convenience for our concerns. Two shades have currently been produced, anthracite grey and espresso brown, the latter appears to be the most popular. The chicness of Comfy’s curved styling accentuates appearances to complement any outside space. Whether intentions are to locate on the patio, front porch, decked outdoor lounging area, balcony or your home-yard’s oasis, Comfy exhibits shapely modish looks. 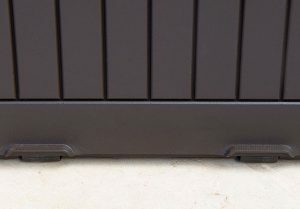 Externally the box expands roughly 116 cm across the facing length, 44 cm deep and 57 cm high therefore considered medium within the deck box world however it will deceivingly shelter a wide selection of storage. 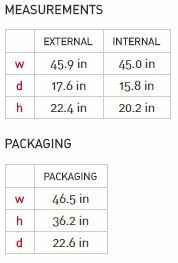 Precise measurements are presented further down the page to compare against your storage & location ideas. Although this deck box won’t become overweight due to the middling size, it’s a snip to move without emptying. During assembly two wheels clip into place on one side of the deck box base to perform their roll. Moving requires lifting the opposite side a tad via the molded hand-grips and pushing into the desired location. We’re always rearranging the patio, I wish our deck box had a pair of these rollers fitted to the underside, sure beats emptying the box prior to positioning, great idea! The cushy appearance virtue of the shapely bowed sides and top’s slender curve is designed to look modishly cosy and provide comfortable seating as the name suggests. Described as heavy-duty, the top is able to sustain a weight-load of 220 kg / 485 lbs which to my reckoning works out approximate to 34 stone therefore provides bench seating for two average adults however there’s no mentions of providing table-top services, maybe the lid is too curvy to accommodate drinks on top without sliding. Operating the opening functions 3 hinges whereby they are initially molded as part of the lid & fascia panels during manufacture therefore don’t require fitting during installation. The hinges simply press & click into their operational clasps adjoining the box body towards the end of constructing. When comparing larger deck box styles, many manufacturers incorporate either gas shock pistons or hinges functioned by springs in order to provide a semi-automatic opening system due to their forced pressure swinging the lid ajar meanwhile their tension averts finger trapping accidents by stepping in to slow-close hefty lid weights, preventing them slamming shut. Comfy neither incorporates automatic openers nor slow-close mechanisms due to the smaller size and reduced lid-weight being light enough to swing open and not slam down too hard therefore it’s probably not highly suited for young kids toy storage but adequate for kids who understand the hazards of the lightweight lid falling down. The lid comprises a molded lip running round the entire perimeter. Upon closure the lip slightly overlaps the fascia’s wall panels in order to maintain dry internals when showered upon by rainfall meanwhile on account of the top’s slight curve, a prompt drainage system is contoured. Alike the hinges, two security clasps are formed onto the lid and box body during manufacture which align when closed for the purpose of slotting a padlock through to secure. Okay, deck boxes never determine total security however padlocking does provide deterrent. I bet you’re guessing assembly must be a piece of cake due to Keter’s innovative molding configuration, all will soon be revealed. Polypropylene constitutes Keter’s method of manufacture as a consequence of its resistance to rot however on account of the resin being immune from decomposing, optimistically these products are 100% reusable therefore at a later date, their environmentally-safe make-up maybe recycled into the future’s groundbreaking deck box designs. Presently however, Comfy’s manufacture contains UV inhibitors to counteract sunburn scorches bleaching and splitting the fascia panels, toughening agents prevent disfigures and peeling meanwhile the composition never requires annual conserving with coats of wood-stain for the purpose of preserving & nurturing. Once the resin manufacture combines all the supplementary protective hardeners with the colour pigments, the molding procedure forms an internal series of resin ridges & ribs for the purpose of providing fascia panel stability simultaneous to artistically creating an enchanting outer-skin mimicking a divine vertical wood-slat presentation contouring elegant curves. I think Keter’s Comfy is one of the nicest looking deck boxes on account of the curvaceous styling despite lacking a few user-friendly features however maintaining the looks couldn’t get anymore basic, virtue of a hasty wipe-over with a damp cloth, finished pronto – in double time. There’s no reason the box can’t maintain the charm for many years to come if looked after, it’s designed to withstand unattractive dents transpiring but will obviously scratch and rupture if abused. You’ve read the title correct, Comfy doesn’t even require a screwdriver to assemble, it’s a similar design to Keter’s Circa that triples up as a table-top & seat however as the name suggests, Circa represents a round deck box whereas Comfy displays the more conventional rectangular shape. Five installation steps fulfil the construction whereby 4 side panels, one base and a lid comprise the significant parts, additionally 4 fillers and 2 wheels conclude the build. Assembly’s described as easy and takes 5 minutes. The 4 side panels adjoin the base by positioning and interlocking followed by aligning the lid with the hinges, pressing and clicking into situ. Afterwards, 4 small filler sections & 2 runner-wheels snap into their location and voila, you’re done. Time to wheel into location and fill with all your bits & bobs. Too many websites promote deck boxes as waterproof but most are only designed weatherproof, there is a difference. If you floated Comfy in a swimming pool it would soon take in water & sink due to the minuscule gaps present in the interlocking mechanisms that connect their fascia panels together however these gaps are highly significant in distributing fresh air to the interior to overcome the progression of foisty atmospheres, critical for storing fabrics. This built-in ventilated system is why most deck boxes are configured & constructed in very similar ways, fresh air is vitally important, especially in humid conditions. Comfy’s tasteful design & artful curves charmingly harmonise outside quiet spots meanwhile conveniently store your outdoorsy accessories along with those bulky lounging cushions. We find a deck box’s handiness a pure benefit stood on our patio. No worries regarding upkeep, an occasional wipe-over with a wet cloth suffices. Although polypropylene will suffer scratches and fractures through rough treatment, it’s designed ever enduring, imperishable & impermeable to combat the year’s seasonable weather conditions. Comfy’s purposely designed to fit most budgets, showcase elegant curvy style, maintain a fresh internal protective environment for a wide selection of storage and provide bench seating inclusive of 2 years warranty meanwhile the addition of wheels simplifies movement. Thanks for inspecting Comfy’s deck storage box with wheels. Share your preferred easy-movable deck box below along with any relevant queries. Pleasure to help. Please share Comfy’s deck box. Thank you. This is a great deck box. It is perfect for storage and you can use it as a bench. I can see a nice pillow placed on top to match your table set and everything. I love your reviews you show some great pieces. Thanks so much for the info! Hey Melissa, thanks for calling in to inspect Keter’s Comfy deck box. I would describe Comfy as an average sized deck box which is able to protectively shelter a whole variation of outdoorsy accessories including those awkward to store seating cushions meanwhile the way modern deck boxes are constructed by interlinking the sections together and clicking into place, faint gaps appear within the interlocking connections which are vitally important in delivering air-current to the internals and controlling the ambience in order to prevent musty odours developing in humid conditions. Yeah, a pillow exhibiting a design that matches your outdoor decor and table set enables creating your unique patio oasis, taking inside outdoors during the warm season – great idea! Wonderful Outside storage deck. I really loved its colour, design and the wheeling option it contain, means no need to call up for moving it. You can easily drag it wherever you want. Now you can easily store outside stuff in this beautiful deck. Very good review. Have a great time! Hey Sarah, thanks for inspecting the features of Comfy’s deck box. I think the curvy sides are what sets Comfy’s presence apart from competing deck boxes because in general, most sides are straight. You immediately realise, combining bowed sides along with a slight curvature lid where Comfy got her name from. The wheels on one side is something our deck box is absent from meanwhile we’re always moving our outdoorsy furniture around which involves emptying the box prior to moving on account of the full weight being too heavy to lift. Being able to lift the opposite side to the wheels a tad and pushing to the desired spot delivers convenience, a real user-friendly design feature. I agree Sarah, Comfy showcases an elegant presence wherever the box is situated, from balconies, small home-yards, BBQ decks or patios. 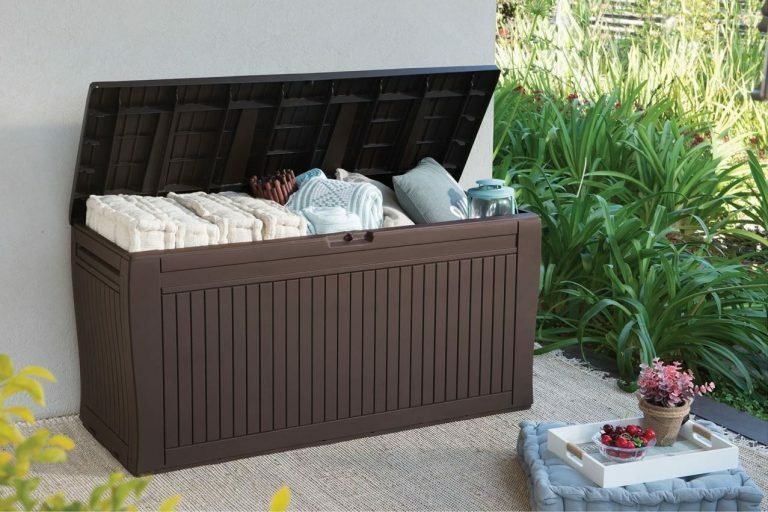 This sounds like a fantastic storage option for an outside area. I love that it has wheels for easier moving-around-because-I-like-to-redecorate-all-the-time functionality. It also seems like it would be very easy to wipe clean. I know you said that the way it’s designed would help remove rainfall, but you also mentioned that if thrown in water, it would sink. Is there any risk of things getting wet in there? Is this better storage for things that OK to get wet? Hi Christina, thanks for inspecting Comfy’s deck box storage with wheels. Comfy’s curvy sides do exhibit an elegant presence sat located on a balcony, porch, poolside or patio meanwhile if you’re always shuffling furniture around in order to create different layouts there’s nothing more advantageous than wheels for locating. The wheels position on one side, moving requires lifting the opposite side and pushing into the intended spot, it’s that simple. The polypropylene manufacture makes these boxes easy to wipe down and freshen their appearance, a procedure that literally takes minutes without succumbing to weather-rot. Most deck boxes are configured in similar ways whereby their fascia panels snap together for an easy installation. The interlocking design that creates these snap together mechanisms contain faint gaps which are vitally important in distributing air current inside to overcome the development of mustiness thereby provide an ideal fresh environment for cushion material storage. These minute gaps would leak if immersed in a flood however all deck boxes are purposely designed weatherproof ensuring rainwater falling down upon them promptly drains off. Deck boxes comprise a clever design whereby the internals remain fresh & dry throughout rainfall showers. I agree with you, Simon, that it is most of the times hard to keep cushiony comforts tidy because of their bulkiness and since I love arranging our place, thereby looking for kinds of stuff that are easy to assemble, this comfy deck box is perfect for people like me. I love the idea of having tables, chairs, and benches that serve as storage boxes as well, not to mention it looks very elegant and clean. Plus plus plus points that I won’t have to ask for any help dragging it since it’s already built with wheels. Hey King Kong’s Girl, thanks for visiting and exploring Keter’s Comfy deck box storage. Furniture sating cushions are awkward & cumbersome items to store. Previously we always had trouble finding room where to squash them out of sight on an evening and when not in use, not anymore. Utilising a deck box suchlike this provides an ideal interior where the environment remains fresh thereby combats musty odours developing. We use our storage box throughout the spring & summer months, then once the cooler autumn weather approaches we place the contents in the loft over winter’s period. 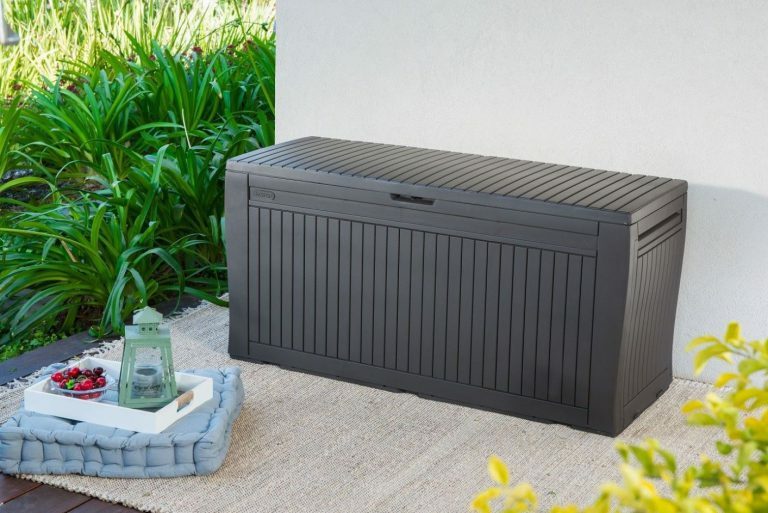 Any type of outdoor storage whether it’s beneath seating, inside a table, deck boxes, low profile units or walk-in sheds is what this website concentrates on, as long as the manufacture is weather-resistant to overcome maintenance issues. Comfy’s display does look elegant, I think it’s the curvy sides which produce the fashionable appearance whereas most deck boxes have straight sides. If I were to move our deck box on my own I would have to empty the contents on account of the box not incorporating wheels however 2 wheels are fitted to one side of Comfy’s underneath. Moving entails lifting the other side and pushing, another convenient feature many deck boxes are absent from. Wow, definitely a must have! 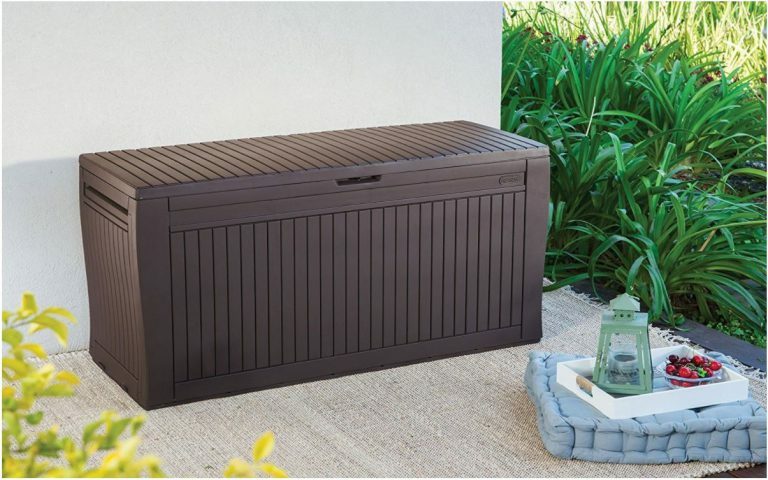 Dual usage outdoor storage box and looks beautiful and the price is really good too. Love this product. Thanks for a great review! Hi Anxiety Panda, thanks for dropping by to read about Keter’s Comfy storage box with wheels. 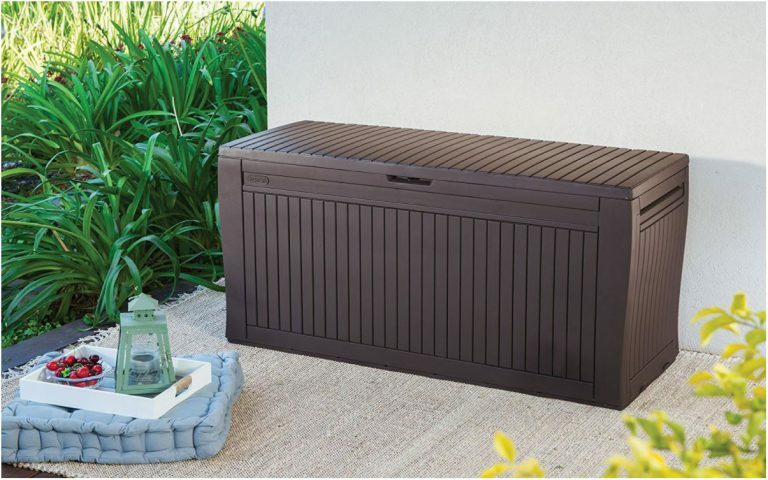 We find a deck box such a handy solution situated on our patio for storing seating cushions. Accommodating their cumbersome size outdoors has overcome many previous issues we were confronted with regards to finding a decent amount of cupboard space indoors where to store. Many people use them for small tools & gardening equipment due to their size being perfect for restricted home-yard spots, others use them as a spacious unit for kids to plonk their toys in after playing, tidying-up’s never been so quick meanwhile situated next to the pool harbouring swimming gear or accommodating sporting tackle are alternative popular usages. I think what entices more attraction regards Comfy’s curvy sides, they exhibit more of a modish appearance when compared to the competition. Interesting site friend, you had alot of different options to choose from. Hi Jeremy, glad you like Quality Plastic Sheds website, thanks for calling in and messaging. This website’s intention is to showcase the most favourable imperishable sheds, deck boxes and outside storage facilities comprising a manufacture not susceptible to weather-depreciation, from the scorch of sunburn attack, frosty cold winters persistent rain-showers or whether positioned long-term in damp conditions, particular environments where the rot soon establishes into wooden structures whereas a resin make-up in comparison remains immune from structural change. I love the look of these boxes. They look stylish and their size is perfect for fitting on the patio without being too bulky. They even serve as extra seating, beneficial for when extra friends pop round. This box is a winner for me! Hi Kat, thanks for exploring Comfy’s deck box credentials. We’ve found the service our deck box provides highly beneficial for outside summer living, their convenience for sheltering furniture seating cushions inside a protective environment without being subject to musty odours far outweighs trying to find roomy cupboard space indoors where to squash-in their awkwardness. I like Comfy’s curvy styling, the wood slat panel guise and the oaky shade, it’s design enchants patios and balcony sitting areas with alluring eye appeal without being too bulky. This size represents small-medium with respect to deck box dimensions. It’s surprising how many times our storage box serves as seating when friends & family call round for BBQ’s, they offer a great addition. Wow this deck storage box really does have it all! 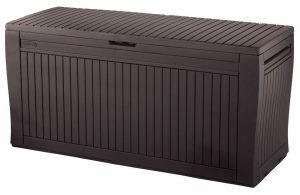 What I love about this product is the fact that it looks great, and not cheap and nasty like other similar garden storage products. This actually blends in nicely due to the natural colours and has the added purpose of making it a handy bench to sit on. I also like the fact that it offers UV protection because so many times you see horrid faded garden cushions that have just been left out day and night in all weathers due to people having nowhere else to store them. Having this handy little unit covers all bases and it is very affordable too considering it will last many years. 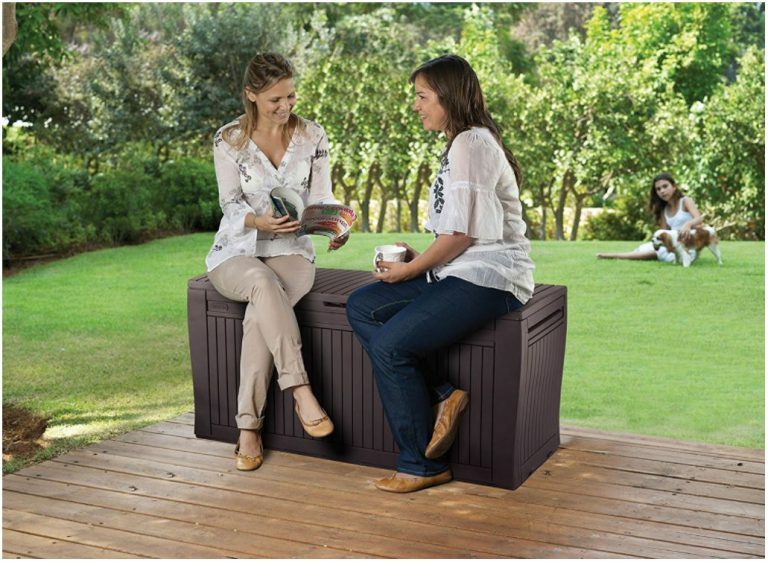 Hi Stefanie, thanks for dropping by to read about Keter’s Comfy deck box containing wheels. Some of the original resin designs display a cheesy plastic presentation, I do agree however new developments in molding methods are now creating immensely realistic wood grain patterns showcasing mirror images of wood whilst mimicking their shades extremely well. I like the way the curvy design of the sides display, it looks comfy too, hence the name however it’s sturdy enough to accommodate two average adults which makes it highly favourable for confined areas and when guests visit. We looked around for something suitable for storing our furniture seating cushions due to not having sufficient room indoors where to squash their bulkiness out of sight. Having the box on the patio has been highly convenient for our purposes, it’s a 2 minutes job to pack away and to set them out meanwhile come Autumn time when the weather cools down we store them in the loft until spring comes knocking on the door. 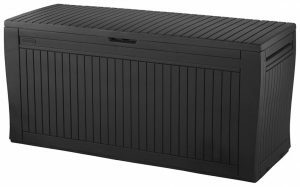 This deck box is affordable, like anything there’s manufactures showcasing even more realistic resemblances to wood such as the Brushwood outdoor storage box however this does demand a higher price. Choosing depends upon one’s budget, eye appeal and size. Having said all that, I like Comfy’s attractive appearance.